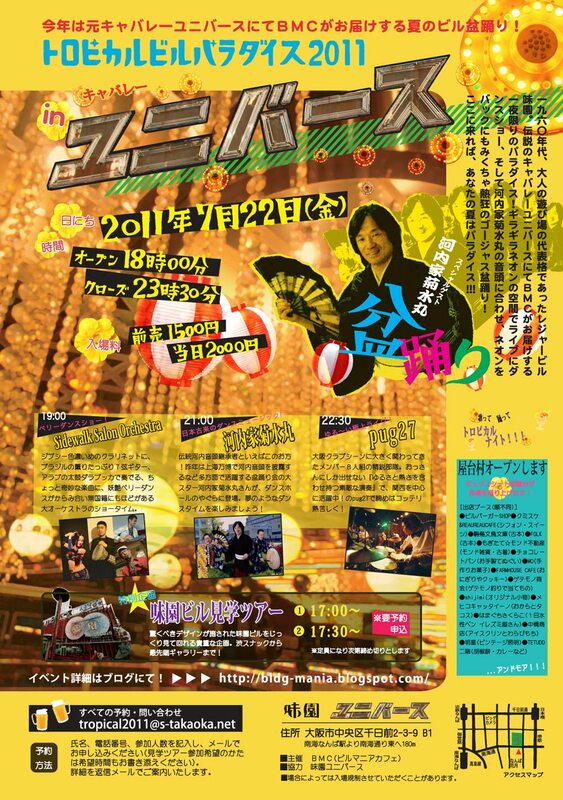 That wonderful Bon Odori night TROPICAL BLDG NIGHT 2011 will be held this weekend! dance Kawachi Ondo in Osaka. *If you want to know more about Bon Odori, please refer the wiki Bon Odori / Kawachi Ondo. So, in this season in Osaka we have lots of Kawachi Ondo evenings and nights. but it has some specialties. century ago in Misono bldg in Minami area in Osaka city. + Kawachiya Kikusuimaru will run a show for the dance! He is the most busiest caller and singer for this Kawachi Ondo. + Not only food stalls but also some shops of vintage lightings, books etc. + A berry dance showtime, a live music performance by pug27 and more! Take it easy and join the circle, though! Osakan people will welcome you with their warm heart!